Pop culture is supposedly all around us in how we dress, what music we listen to, and what we see on television. Sadly however, I believe that those who think that whatever is popular right now must be pop culture is sadly mistaken. 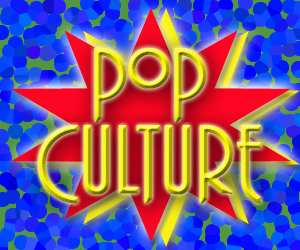 Before getting into the nitty-gritty, what is the definition of pop culture? According to about.com, it is “the accumulated store of cultural products such as music, art, literature, fashion, dance, film, television, and radio that are consumed primarily by non-elite groups such as the working, lower, and middle class.” Now a key word I see in that definition is the word “accumulated” which means something is built up over time. What is being built up then? The information, fads and trends that go along with pop culture. This definition is clearly different than what the public perception of pop culture is today which, as mentioned, is defined by what is popular and having an impact right now. So I ask for your consideration: is pop culture the entertainment we as a human race are all receiving now or is pop culture the societal impact that the culture had on us at that time which has lasted through time to have an effect on us now? There is a commonly known saying that good things take time and while one can deem pop culture as good and even bad, I believe that one cannot even deem what pop culture is in the present and that it can only be determined in the future. It is only then that one can examine pop culture at that time, compare it to the present day, and decide whether the popular culture had a positive or negative effect on the general public. But what do I mean by looking in the past to decide what pop culture was, in order to judge whether it had a positive or negative effect on the world? To further explain this, here are two examples. Recently, citizens and the media of the world are currently obsessed with missing Malaysian Airlines Flight 370. Did the plane crash in the ocean? Did it crash on land? Was the plane taken over by terrorists? Even though there is little evidence and facts about the case at this time, the theories and ideas have run the gambit as evidenced in an article by The Washington Post listing several of the theories that have been brought up. Now if one of the more extreme theories is true, such as if the plane had a ground crash and/or ground landing or if a terrorist took over the plane, there is a good chance that this whole ordeal will become part of the pop culture due to the intense media coverage and the mystery and curiousness that the world became entrenched with for these weeks about this missing plane. Yet on the other hand, if it is found that the plane just had a mechanical error and crashed in the ocean, I can say with almost certainty that the public will soon forget this entire event and that this event was “fake” pop culture. Why? The outcome was not exciting, unique, or extremely memorable compared to other air disasters in history such as the Lockerbie bombing or the tragic events of 9/11. So yes, right now, one could deem this plane disappearance as a major part of our pop culture, but that is because of the impact it is having right now. I am arguing that the positive or negative impact cannot be known until the event, fad, trend, etc. ends, and the public, historians, and experts can reflect on what happened in comparison to the time and years before. Flashback to February 9th, 1964. This is a date that might not be as familiar in your mind compared to the bombing of Pearl Harbor or Independence Day, but it is a day that is widely viewed as the start of the British Invasion and the further explosion of rock and roll music in America and around the world. This was the day that The Beatles played on the Ed Sullivan Show before a screaming crowd of girls and a fascinated crowd watching on their television screens in homes across America. Several music types were torn as to whether this band from Liverpool would have an impact or if they would fizzle out like a lot of the other rock and roll bands at the time. However, as The Beatles continued to make music, draw large groups of fans to their concerts, and became so popular John Lennon received much flak for saying that “Christianity will go…it will vanish and shrink. I needn’t argue about that. I’m right and I’ll be proved right. We’re more popular than Jesus now.” While the part about Christianity still has not come true, it was true that The Beatles’ impact was so humongous and could not be ignored that more people were paying attention to their music and what they were up to than they were in taking the time to go to church or synagogue. But, it was not until after the band broke up in 1970 that music enthusiasts and historians could look back to note that The Beatles played a huge part in the pop culture of the 1960s and that their influence was a positive one as they influenced other musical artists that helped form the music genres and hits of the 1970s to today. Judgment on The Beatles’ impact could have been given that February in 1964 or even later in the 1960s when their other famous albums were released, but the most accurate, valuable, and quoted critiques are years after. All in all, society likes to live in the here and now but fail to see what is actually important going forward. It is only in the future that one can determine whether something was part of pop culture, and then if it is, whether it was a positive or negative influence. So all in all, what is pop culture? It is what society in the future can look back upon and point directly to certain events and trends that created the identity of the time that effects the present. After figuring that out, then one can ask whether pop culture is good or bad. My answer on that question? It all depends on the impact that it had the nation and the world.